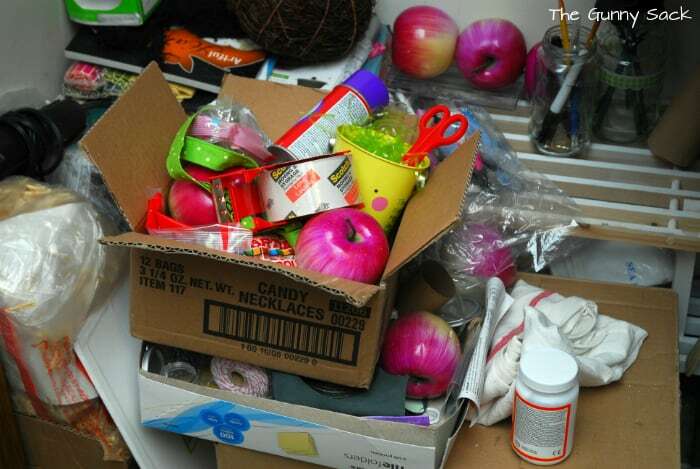 Wondering what this messy pile of junk in a closet has to do with this blog? That is my goal for January. The picture is one of my craft “spaces”…many of which seem to be taking over the house. The holidays are over and I am ready to tackle organizing my craft supplies. I would say my tipping point was holiday crafting and not always being able to find things when I want them. For example, I was looking for some gray thread over the holidays but couldn’t find any and figured I must have used it all but I recently found it in the file folder box that you can see in the picture above! I do have a craft area in our basement that I was slowly working on organizing before the holidays but I still have a lot of work to do. 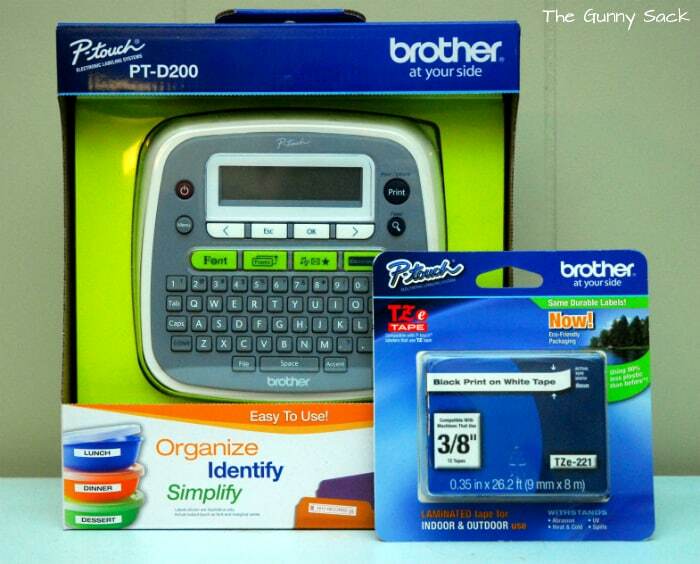 I was chosen to be a Brother P-Touch Labeler Ambassador for the month of January and was sent this labeler to try out. So, as I am going about organizing my craft supplies, I will be using this labeler. Labels will help to keep things organized and any containers that aren’t clear won’t have to be opened to see what is inside them. I like that I can use different fonts, symbols and frames on the labels. I received white tape with black print but I like that I can purchase additional colors if I want. The tape is laminated and they are peel and stick labels. I just need to choose my font, type in what I want the label to say and hit print. There is even a cutter in the upper right corner so I won’t need my scissors! There are other areas of our house that I would like to organize as well like the bathroom cabinets, our computer desk and the kitchen cabinets. I think my husband will like the labeler for out in the garage and my kids will like using it for things in their bedrooms. But I need to concentrate on one area of the house at a time. I will try to post about how the craft area organization is going every so often and if I come up with any great ideas I will be sure to share! What are you organizing this month? I actually just spend the entire weekend working on organizing my craft space. It had gotten to the point that I couldn’t get in to it to actually craft anything! Ridiculous. Totally <3 label makers. I keep on on our main floor and one upstairs because I label everything! Haha – I can totally relate! My “craft space” is our dining room table…and every drawer/closet/cupboard space I can get my hands on! My husband makes comments regularly about me needing to organize my stuff (aka put it away! )…thanks for the cute ideas! Don’t you just drool over those huge craft studio that some people have? Ahhh…someday, right? That is awesome! I like to take things out but then friends decide to stop by and I quickly shove the stuff in my closet. 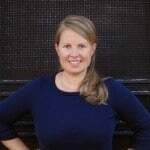 I just watched a show on HGTV, called Clean Freaks that was all about organizing! It was awesome and so full of tips. The BIGGEST most important tip was LABELING! So you are off to a great start with that labeler! Good luck! I hope to accomplish similar goals too! Thanks Jenna! I’m happy to hear that I am on the right track! I don’t seem to be organizing anything so far this month, but I’m getting lots of ideas if I ever start! That’s okay Bliss! You just keep creating wonderful pieces! I would love to get my craft space organized…not to mention the rest of the house. I have started on it, but I have not had the time to jump in the way I wanted. I guess something is better than nothing. 😉 During my cleaning I found duplicate patterns that I bought. Either I like them A LOT, or I am so messy I can’t remember what I already own. LOL! Ha! That is funny! I am hoping to get mine done by doing a little each day so I don’t get overwhelmed. Craft space? What craft space? Tell me about it. I refuse to craft half the time because I can’t put my hands on things when I want them. I’ve got a labeller somewhere. Heaven only knows where it is. This is also my challenge in January, once the kids go back to school. The house is in reasonable condition. Downstairs craft and sewing is highest on the priority list. I agree! It would be hard to organize when the kids are home! My house is in good condition as well but upon closer inspection my closets and bins have got to get organized!